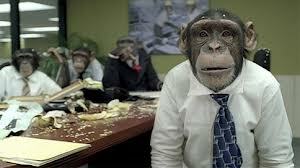 Dawn of the Planet of the Apes was lauded for using CGI rather than live animals in its presentation of chimpanzees. The entertainment industry harms primates in ways beyond the horrific living conditions and abuse. Primates never cease to amaze people. Great apes are our closest genetic relatives, and the novelty of seeing these animals in human environments is particularly fascinating. Because of this interest, primates are often used in the entertainment industry to provide a comedic relief to movies, circus acts, and even advertisements. Primates used for entertainment are almost always babies, as they are “cuter” and easier to control than their adult counterparts. This only exacerbates problems for exotic animals because it increases poaching, illegal trading, and hasty breeding practices. Many chimpanzees or gorillas that are used for entertainment are obtained by poachers in Africa who kill the entire family of animals, selling the adults as bushmeat and trading the babies to buyers across the globe. Although the trading of endangered animals is illegal, animal traffickers bribe officials for permits or hide animals in cargo shipments. While the use of primates for entertainment in South Asia is particularly bad, namely due to a lack of regulations and activities such as orangutan boxing, their use in the United States is still disturbing. Until 2015, it was legal to trade captive-born chimpanzees within the States, due to a split regulation ruling that stated already captive chimpanzees were legally considered Threatened animals, even though all wild Chimpanzees are considered Endangered Species. In 2015, the United States changed this split regulation, granting all chimpanzees, regardless of previous captivity, protection under the Endangered Species Act (ESA). Chimpanzees may be trained to perform unnatural behaviors to entertain audiences, a practice that is unsafe for chimps and humans. 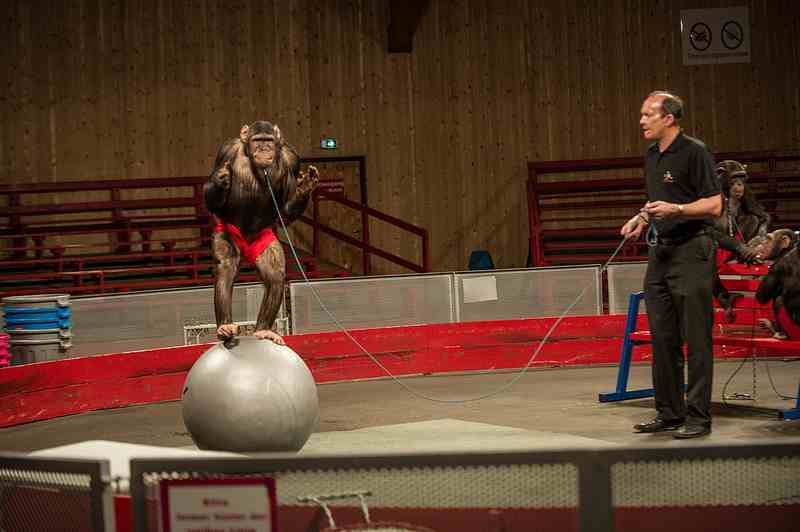 Primate trainers working in all fields claim to use only positive reinforcement while working with their animals. However, many of the animals used in films and advertisements are trained to perform natural fear responses, such as “smiling” in chimpanzees. People often mistake fear responses as signs of happiness, failing to realize that the actions taken to make an animal perform can be truly horrifying. And what happens to animal performers when they become too big to handle? Since apes are only used in entertainment until about 7 years old, the practice is highly unsustainable. These animals are permanently damaged from living in fear and without companionship from other animals. This is detrimental to any future they could gain at a sanctuary or zoo. Without experience in socialized environments, they may never be able to live in a proper group with others of their kind. Because of the difficulties in rehabilitation, many primates end up in unsuitable homes or attractions. The use of chimpanzees in entertainment has also had a negative effect on people’s perception of their status as an endangered species. A study by Schroepfer and colleagues titled Use of “Entertainment” Chimpanzees in Commercials Distorts Public Perception Regarding Their Conservation Status (2011) found that commercials using chimpanzees as entertainment negatively impacted respondent’s perception of the endangered species status of chimps. Along with misunderstanding conservation needs for chimpanzees, the respondents also showed a higher level of interest in owning a chimpanzee as a pet, with 35% of respondents watching an entertainment ad saying private citizens should have the right to own a chimpanzee. As video editing and animatronics has improved, it is now possible to create very realistic representations of all animals with only a computer and the right software. In this day and age, there is no reason live animals should be used in the entertainment industry. PASA encourages viewers to be aware of the implications for animals used for entertainment and to stay informed about films featuring animals. Chimpanzees are commonly used across media, like this chimp featured in an advertisement. 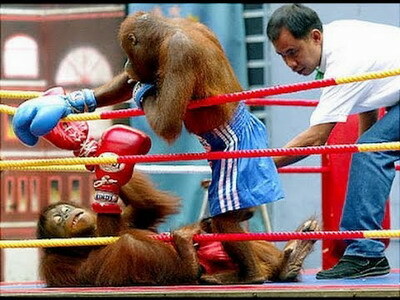 The practice of orangutan boxing is an ongoing issue in Southeast Asia, where young orangutans stolen from the wild and sold through the exotic wildlife trade are forced to throw punches and kicks at each other.